In our previous blogs we covered topics such as remote working, the digital workplace, how to choose the right Skype for Business web client and how VOIP enhances organisational productivity. In this blog we are going to showcase how MindLink Anywhere: our feature enhanced Skype for Business web client now with added VOIP capabilities, addresses the issues uncovered by those topics. In the context of remote working, a common problem faced by any participant in remote working is communication. With the absence of frequent interpersonal communication, it can be difficult for teams to engage, discuss and understand each other which calls for a substituting solution within the digital workplace. At this point it is important to understand that a choosing a communication solution is not a one-size fits all situation. Organisations make this mistake at their own peril. Our earlier blog points out what to beware of and what factors need extra attention when choosing a solution. In the scenario of a Skype for Business deployment, especially now where customers are being ushered onto new, emerging platforms, we observe a strong perception among customers that Skype for Business doesn’t tick all of their organisation's requirements. Simultaneously, upcoming and alternative solutions aren’t quite ready to cater to every need either. This puts organisations with Skype for Business deployments between a rock and a hard place for the time being. Taking this into consideration, there is a third option which not many have evaluated, but may well be the key to maintain productivity within the digital workplace. This is the option to leverage third party Skype for Business solutions that extend the lifecycle of Skype for Business but more importantly, enhance the capabilities of the underlying platform. Introducing MindLink Anywhere, a Skype for Business solution designed for the digital workplace with needs of remote working at heart. MindLink Anywhere is a Skype for Business web application that allows secure browser access to Skype for Business using any web-browser over HTTPS, and it’s not just the meetings, users can access instant messaging, presence, group chat and one to one voice calling (New!) directly from their browser window. The MindLink Anywhere user experience has been designed to reflect the best practices from consumer applications. This makes MindLink Anywhere highly intuitive to use and lowers the barriers to user adoption, helping organisations get more out of their Skype for Business deployments. With the upcoming release of version 18.7, MindLink Anywhere introduces new voice calling capabilities. This places the features and capabilities of MindLink Anywhere ahead of native capabilities in the scope of a remote working solution. As a secure web application providing access to Skype for Business for Mac, Windows and Linux using any web-browser it guarantees users within the digital workplace an identical user experience both in and outside the office. What’s more is that it requires absolutely no installation or configuration by the user, eliminating a potential source of frustration before the app is used thereby lowering the barrier to adoption. This is important as it streamlines their ability to work in the office, from home, or anywhere else. No matter where the users are located, they have access to the same communication tools as their colleagues. Hashtags and improved @Mentions support, use #tags in persistent chat rooms and filtering by #tag, mentions support is enhanced to allow individual user tagging by typing @ followed by another character, and using the autocomplete list to select any member of that chat room. LiveStream capability, monitor selected chat rooms and any instant messaging conversations in a collapsible view within your browser window. Persistent Instant Messages, besides persistent chat, natively supported in Skype for Business, MindLink Anywhere can be configured to save and load conversation history for instant messages between contacts ensuring any business-critical information is not lost. 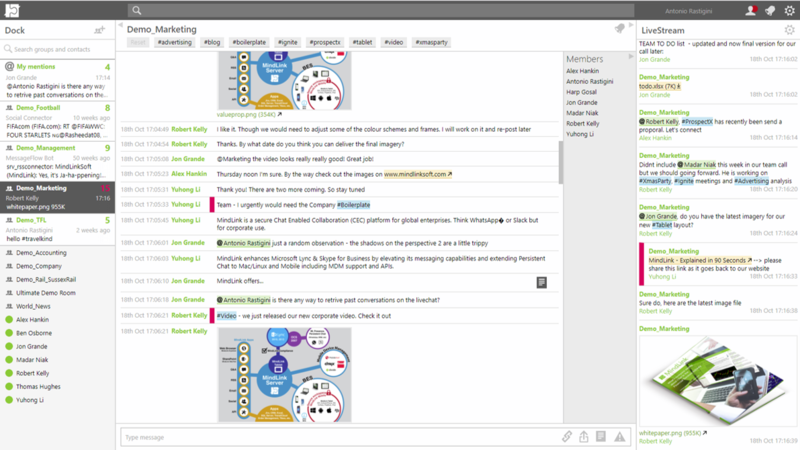 MindLink Anywhere is a powerful enhancement to Skype for Business within the digital workplace and particularly for remote users. For more information about upgrading your Skype for Business deployment with MindLink Anywhere get in touch today!